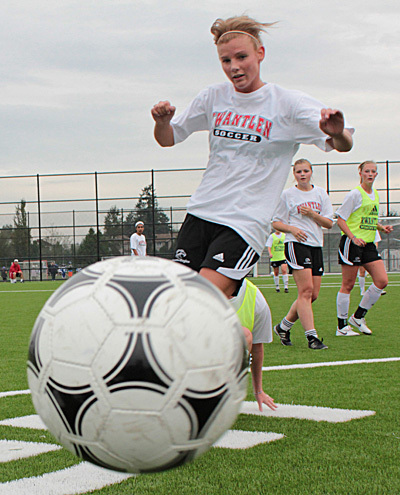 “There’s an expectation,” says Gordon Smith, the new head coach of the Kwantlen Eagles women’s soccer team. As a new season gets under way for the team there are high expectations. Last season, the team used penalty shootouts to power their way to a provincial title and a bronze medal finish at the nationals, the first national medal of any kind for Kwantlen. But with only seven players from that championship team returning, it isn’t going to be easy and youth will be the highlight of the new squad. The biggest hole for the Eagles to fill will be the 24×8-foot net at their end of the field. Last year’s starting goalkeeper, Amelia Ng, was the not only the team’s MVP, but also the provincial tournament’s MVP for her performance in the playoffs. Filling Ng’s net will be new rookie recruit, Melina Gomez. Smith said they have challenged the other keepers to battle hard for the starting role but Gomez should continue to start for now. Gomez looks to be just one part of the new youth movement for the team, which has 10 rookies on the roster. But, like any good team, the Eagles will rely heavily on their veterans to guide the team. That starts with their captain, defender Brittany McNeill, who looks to play an even larger role with the team this year. “The returning players have a great work ethic and a great attitude and they want to win,” said Assistant Coach Joan McEachern, who has been with the team since 2003. Both McEachern and Smith are confident of the team’s chances of success this year but are quick to point out that it will be no easy task, as there are a lot of good teams in the province. “I was just thinking about that the other day: Who has repeated in the last four years? No one. It speaks volumes to the parity in the league,” said McEachern. The last team to repeat as provincial champs was the Langara Falcons in ’06-’07. After becoming the first Kwantlen team to win a national medal, the Eagles are confident going into the ’10-’11 season. “I think that everyone’s goal is to get to Nationals again… and see if we can catch lightning in a bottle again,” said Smith.